Paulo has been playing Magic since he was eight years old. At fifteen, he ventured outside of Brazil for his first international tournament, and he's been globetrotting as a professional player ever since. If you scour through the Top 25 and Top 32 of Grand Prix Orlando and Brussels, you'll mostly find a combination of red decks, Esper Control, Turbo Fog, and some green builds. Among them, however, there's a hidden gem: a White-Blue Cycling deck piloted by Corey Lerch. This is a deck I like a lot (I even played a version of it in a Grand Prix earlier this year). I think the cycling cards are naturally underrated—Censor, for example, is almost never played, even though it's pretty good on its own—and the Drake Haven aspect pushes them over the top. The main difference between White-Blue Cycling and traditional white-blue control decks is that you have the ability to apply pressure. Drake Haven comes down early in the game and starts making two or more Drakes per turn for the rest of the game, which is actually a pretty fast clock that also threatens planeswalkers. This gives your deck a dimension that other decks aren't necessarily prepared to handle out of control decks, which gives you an edge in any slow matchup. If you're playing the white-blue mirror, for example, the cycling deck will invariably be favored, because it has a must-deal-with threat that only costs three mana. If Drake Haven resolves and isn't immediately hit by Cast Out or Teferi, then it's very hard for the other deck to win. I also like Drake Haven in post-sideboard games, because the pressure element is even better there. In Game 1s, people will have Fatal Pushes, Magma Sprays, Unlicensed Disintegrations, Settle the Wreckages, Fumigates—those cards won't beat Drake Haven by themselves, but they will have a use. 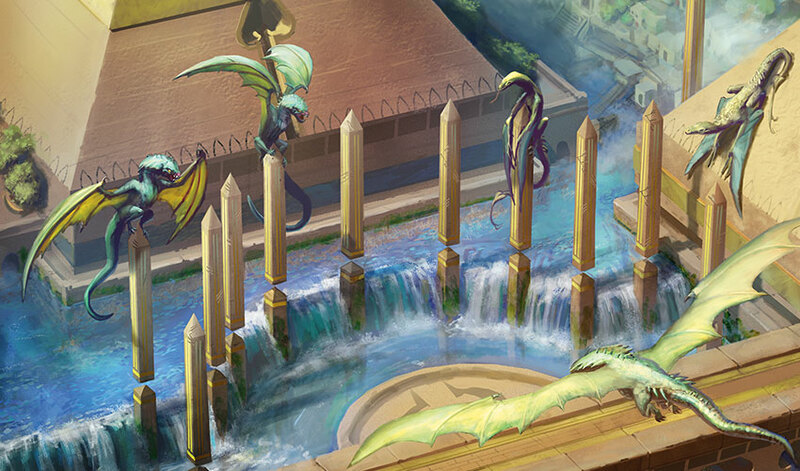 Post board, most of those will leave the opponents' decks, which makes the Drakes even better. Instead, people side in cards like Negate; Duress; Jace's Defeat; Glint-Sleeve Siphoner; Karn, Scion of Urza; Lifecrafter's Bestiary; and The Eldest Reborn, all of which are not very effective versus Drake Haven. The disruption spells can deal with it, of course, but that's another must-counter threat, and it's cheap enough that you can usually play it and protect it in the same turn. Drake Haven also has a cool interaction against discard spells, since you can make tokens when they Duress you, for example. Of course, this is not to say that White-Blue Cycling is a strictly better version of White-Blue Control—otherwise, no one would play White-Blue Control and everyone would play White-Blue Cycling. It's undeniably stronger in the control matchups, but it suffers a little more against aggressive decks since there's a cost to running those Drake Havens and spending your early turns cycling cards. A normal white-blue deck can run four Seal Aways, whereas Corey's deck, for example, runs only two. Glimmer of Genius is a better card than Hieroglyphic Illumination, but you have to run four Illuminations and zero Glimmers if you play Haven. So, all in all, for a metagame that is full of slower decks, White-Blue Cycling is better than classic white-blue. Given that there were three Esper decks in the Top 8 of GP Orlando, and that Grixis and Turbo Fog are also popular decks, this might just be the metagame for it. Of course, red aggro is the most popular deck, so things balance themselves out in that regard, but if people play the burn-heavy version, then it's great to have access to Renewed Faith. If you're looking for a change of pace in your control deck, I definitely recommend White-Blue Cycling. There are some changes I'd make to Corey's deck. The first change is that I think Teferi, Hero of Dominaria is simply a better version of Abandoned Sarcophagus. It's good enough in the late game, but much better on turn five. The second change is that I think you need a higher amount of lands. There are a lot of cyclers, but you need to make your land drops to win, and you sometimes have to cast spells on turns two, three, or four. Corey played 22 lands; I'd play 25. I'd also cut a Drake Haven from the main deck. You don't want to be "Drake Haven flooded" in a lot of matchups, and you cycle a lot of cards—you will find them in the slower matchups, they don't need to come down on turn three. It's better if they do, of course, so a fourth is in the board, alongside some Torrential Gearhulks that are very good when people bring in Duress and Negate for Game 2.